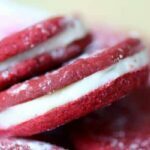 Bright red velvet sandwich cookies filled with a white chocolate bourbon ganache are perfect for the holidays or anytime you want a treat. Beat butter, cream cheese, sugar, vanilla, and food coloring until fluffy. With the mixer on low speed stir in the flour mixture until well mixed. Form dough into a disk. Wrap in waxed paper and chill for several hours or overnight. Cut the dough in 3 equal pieces. Place 2 of the pieces back in the refrigerator. Spread a piece of waxed paper on the counter. Sprinkle the waxed paper lightly with flour. Place the dough on top of the floured waxed paper. Sprinkle lightly with more flour. Put a piece of waxed paper over the top, covering it completely. Roll the chilled dough out to 1/8-inch thickness. Remove the top layer of waxed paper. Cut into desired shapes and place on a silicone or parchment covered baking sheet. Cookies will crisp as they cool. Heat the heavy cream until bubbles form around the sides of the pan and it is almost ready to boil. Add the bourbon if you are using it. Quickly stir in the white chocolate. Stir until the mixture is smooth and no pieces of white chocolate remain. Chill until thick and spreadable. If it gets too thick you can warm it back up a little in the microwave. If it doesn't get thick enough you can warm it up in the microwave and stir in a little more white chocolate. Match the cookies up by size, keeping them as close to the same size as possible. Place one cookie, bottom side up on the counter. Spread with a layer of the ganache. Place another cookie bottom side down over the filling. Dust with confectioner's sugar if desired.